From a Jack O’ Lantern walk to pumpkin bowling and hair-raising laser tag, these Halloween events for kids in Northern Michigan are spooktacular. Visit Pond Hill Farm from 11 a.m. to 5 p.m. for cider and donuts, pumpkin bowling and smashing, hayrides, a squash rocket and more. Admission is free; activities are priced individually. Grades 6–12 are invited to Northern Lights Recreation for Halloween fun. A $20 admission gets you unlimited bone-chilling bowling, including shoe rental, unlimited hair-raising laser tag, pop, popcorn, 3.00 arcade card and DJ Mike Williford will be spinning all night (8–11 p.m.). Costumes will be judged at 10:30 p.m. and awards will be given for first, second and third place. Costumes aren’t required, though. 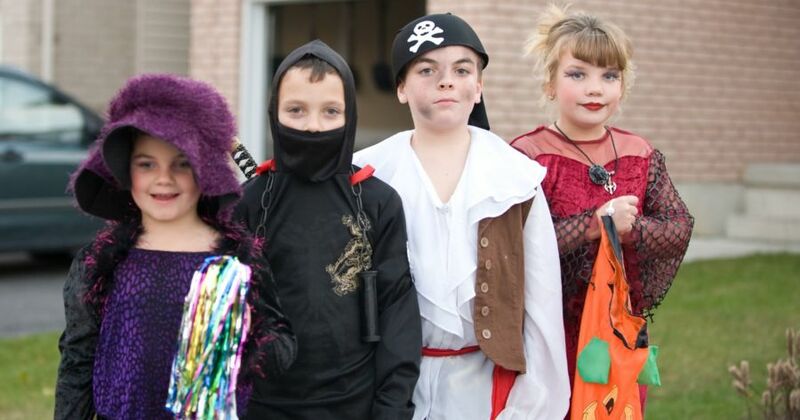 There will also be a family-friendly Halloween fundraiser and costume contest Oct. 26. Proceeds will benefit adult, youth and community projects sponsored by the Petoskey Emmet USBC. Northern Michigan Equine Therapy in Boyne City is hosting a family-friendly fundraiser. Joggers and walkers can choose between a 1-mile walk or 5K run. The horses will wear their costumes, so don’t forget yours! Registration the day of costs $35. Pre-registration is $25 and ends Oct. 18. Join Grass River Natural Area for a super-fun, all-ages community event. Take a stroll through the forest on the trick-or-treat trail and enjoy fall arts and crafts. Relax with a complimentary glass of wine under the tent while your little ones make apple cider and snack on the famous Gallagher Farm Market pumpkin donuts. There will be outdoor games and wagon rides through the vineyard and farm. Explore Rove Point Trail and take a short hike to the highest point on the Leelanau Peninsula. Tickets are required ($20/adult and $10/child). Glass service/wagon tours will start on the hour (11 a.m. through 4 p.m.). Tickets are specific to the time selected. Arrive at least 10 minutes early. Head to the Great Lakes Maritime Heritage Center for Halloween fun. Come in costume and navigate the haunted house, play fun games and build crafts with the Home Depot. This event is free for all ages. Food, live music and dancing will make for a fun night at one of the most haunted locations in Traverse City. Head to The Village at Grand Traverse Commons for family-friendly trick-or-treating and food trucks from 3–5 p.m. Happy Hour runs from 3–6 p.m. with specials on food, beer, wine and cocktails. Admission is free from 3–8 p.m. Adults only from 8 p.m. to midnight. Your ticket includes admission and one drink of choice at the 21+ party. Trick or treat at participating downtown stores from 10–11:30 a.m. Costumes encouraged! Get your costume ready and put on your dancing shoes. Enjoy a hot dog bar, chili and beverages available for purchase. Bring a ghoulish dish to share at the community table of treats. Everyone is encouraged to bring and donate a carved pumpkin for the jack-o-lantern raffle and contest. The night will begin with games, face-painting and kid jams at center stage, but the DJ will kick it up a notch in the later hours. There is no entrance fee but donations are welcome. All proceeds will benefit the Leelanau Montessori Public School Academy. The costume parade starts at 10 a.m. at Central Elementary School (arrive at 9:45 a.m.) and heads down Howard Street. Downtown shops with a trick-or-treat poster on their door welcome you for treats and treasures from 10 a.m. to noon. Teal pumpkins signal non-food treats for children with allergies. At dusk, Downtown Petoskey will host the first Jack O’Lantern Walk in Pennsylvania Park. Help line the sidewalks of the park with carved pumpkins between noon–6 p.m. Each pumpkin you bring gets you entered into the Halloween JACKPot. The Jack O’ Lanterns will all be lit at sunset.